Knowing how to create a burning desire is one of the forgotten secrets of the Law of Attraction. You need to have it to be successful with manifesting. It is one of the most important questions you should ask yourself all the time. You should monitor the desire for your big dream(s) all the time! The term “burning desire” is sort of vague to many people. It sounds great, but most people have no idea what it really means. Which is one of the reasons they don’t get what they want. Did you know that? Now you do! What about you? Do you have a real strong desire for those beautiful things you wish to attract? Especially in your Law of Attraction practice, having a burning desire, means a lot more, than “just” wanting something. A burning desire should be a super strong vibration. Once you really understand the importance and develop one, you will be unstoppable and most definitely attract all your dreams and desires! A burning desire is like fuel, it is like the gasoline that drives your car. People who have a strong desire are fueled all the time! Nothing can change their mind. They go for it! No matter what it takes. Because they see the end result. They made a decision that nothing can stop them from getting it. This is the attitude you need to get what you want and to make the Law of Attraction work in your favor. If the vibration of your desire is weak, it will have no or just a little impact on the Universe. Not the result you wish for. The Law of Attraction simply responds to your dominant thoughts and especially to the vibration behind those thoughts. Our Universe is based on energy and vibration. Everything is always moving and expanding in thousands of different patterns (vibrations). Then you need to develop a strong burning desire to really make an impression on the Universe. You see, the Universe isn’t personal. It simply plays a role in the process of the Law of Attraction. Just like the Universe supports the Law of Gravity. So your desire for money is there somewhere. It’s on your mind. But at the same time you have an unconscious programming playing in the background. Perhaps it’s a type of programming that keeps you worried about the bills, or you believe having a lot of money isn’t possible, or so. In that case your subconscious program is stronger than your desire. The programming is the winner of the game. The subconscious programming is in the way. The Universe follows your most dominant vibes and in case of the example this never leads to prosperity. The desire for money is just an example. It always works that way for everything else in your life. There are no exceptions to this beautiful “game”. So it’s time to learn to play by the rules! 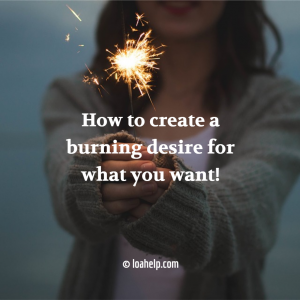 There is another reason why you should create a burning desire for what it is you want so badly. When you decide to go for your dream(s) using the Law of Attraction, you should keep in mind, that it is not as simple as sitting on your sofa chanting affirmations for a couple of minutes a day. That is not enough to get stuff moving towards you. It really takes a lot more to get what you want. For this you need a strong motivation. You need that burning thing that’s called a desire. Not “just a desire”. It must be on your mind all the time! Your desire must literally set you on fire! Have you ever experienced a state of “no matter what, I will get is”? That is the attitude you need to get what you want! When you’re in such a vibration, the Universe can’t do anything else than respond to your powerful vibes. Sadly most people don’t develop such an attitude. The majority doesn’t understand the importance. They were mislead by so called Law of Attraction gurus that claimed you don’t have to do a thing. Like the money will fall from the ceiling on your lap or so. What happens when your desire isn’t strong enough? Having a weak desire will send out weak vibrations to the Universe. The Law of Attraction is based on the “like attracts like” principle. Sending out weak vibrations results into weak matches from the Universe. It is a law and you cannot change this law. Just like gravity. You can’t change that either. What you can do though, is live in harmony with the principles of the laws that govern our planet. The Law of Attraction principle about energy is really simple and yet for a lot of people so hard to grasp. We are conditioned this way. Which results in weak energy when it comes to our big dreams. That is because the majority of people have a “keep hoping and praying it comes when the time is right mentality”. Which almost always results in the situation that the things they want to manifest will never come. The Universe matches the hope, because it can’t do anything else than matching what is in your vibrational field. When you haven’t got a burning desire at all, or it’s too weak, you will never be successful at manifesting all you want. Do you? How do you motivate yourself to do whatever it takes to get what you want? Think about it, it means for example that you should be willing to give up a favorite activity so you can focus on manifesting your dream(s). Lots of people wouldn’t want to do that. Would you be willing to turn off the television for a year or so, to really learn about how the Law of Attraction works? This is just an example of course. Lots of people would already feel some resistance and maybe their old programming pops up and tells them: “No, I don’t need that, it can be done much easier…” It is not because people are lazy! You are not lazy either. Okay, some people are, but you are reading this, which means you’re an action taker. Otherwise you wouldn’t be here. So if it’s not laziness then what is the reason people are not willing to do whatever it takes? The answer? Ignorance! In order to get what you want, you need to do certain things. Stuff that is in harmony with the Laws of the Universe. You’ve got to learn how to play the game. This means you have to do things. And above al it means you have to give up other things as well. If people understood why it is so important to create a burning desire, the majority of them would take action! I just know that. It worked the same for me. Once I understood how important this is, I changed my way of living and thinking (gradually). With great results. I developed that burning desire to go for whatever it is I want. And I just know many people, you might be one of them, would act the same way I did. 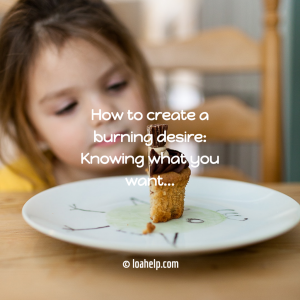 If you want to develop that desire that fires you, you need to know what you want. You must want it so very badly. Not just a little. But really want it! If you have a crystal clear picture about what it is that you want the burning desire to get it will follow automatically. Do you know what your big dreams are? I don’t mean those little ones, not the “wouldn’t it be nice if we had pizza tonight” things. I mean the stuff you want big time. Do you really know what you want? Most people have no idea! They are stuck in the ratrace. People learned to be satisfied with what they’ve got. Which is a sad thing. Because feeling satisfied keeps you stuck. I learned this from one of my mentors, Bob Proctor. You can be happy with your current situation, but never be satisfied. Being satisfied always means stagnation. This is not in harmony with the laws of the Universe. The Universe is always moving, always in motion, always expanding and growing. You are part of the Universe and should do the same. It is in your nature. It is your Divine birthright! This means that you must become aware of what you want! It really doesn’t matter if you have no idea how to get it. That is not important. What is important, is that you know what it is that you want. Maybe the thought of going for it scares you a bit right now. Because it’s such a big dream and you almost don’t dare to believe it’s even possible for you to get it. Take a deep breath… You can have it all. Forget about the thoughts you learned to think. Thoughts of lack and limitation. That is not why you are here. You are here to enjoy your life to the fullest. You’re not here to live a limited, unhappy life! What if everything was possible? If I had a magic wand for you right now, what would you wish? Really think about it. Start writing it down. Create a list of all the things you would love to have, but haven’t right now. This can be big and small things, it doesn’t really matter. When you’re finished, read through your list. Which of these dreams you wrote down, makes your heart sing? It may scare you a bit, it may make you a bit nervous maybe. That is no problem. It is a great sign, that it is really important to you. It should be! Make sure it is something with a mix of really wanting it so badly and on the other hand scaring you. By choosing that big dream you want to go for. No matter what it takes. Even if you have to get up at 5 am each morning you will do that, if that’s what it takes. Imagining you have it, will create that feeling. Believing that it is possible. You don’t have to know how. All you need to know is that you will get it! No doubts on your mind. You want this thing, this dream and you’re determined. Stay tuned because I will show you the way to get what you want. For now you need to develop that burning desire by focusing on your big dream and by realizing the importance of being on fire to get it. Truly understand that you will need to do certain things. Being happy to do them. If you do, you will get what you want. What is your burning desire? What sets you on fire? Did you create a list and did you pick your biggest dream? Share your dream(s) in the comments. Does the idea of having it fuel you? Does it make you super happy and bit bit scared at the same time? 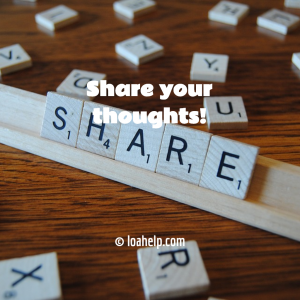 Do you have questions or do you just want to share your thoughts? Please feel free to write what’s on your mind. If I can be of support, just let me know. I am there for you and you will always get a personal reply from me really fast. I promise! Because I care about you and it’s my passion to help you on your path to living the life of your dreams! I think my main problem is consistency still working on it and also being around the right people with the right energy but then as Bob would say “Dont let whats happening on the outside dictate what goes on Inside”. I honestly got a bit flustered a couple weeks ago but in failing I decided to get back up again to start with my 30 day routine, I wont lie to you it has been challenging but I know I can and will achieve what I want by just sticking with it. I’m keeping positive thoughts and acting the same way too. This post has further given me the drive to keep going and I thank you. Hi Adrian, thank you so very much for your kind words and for sharing with me. Earl Nightingale and Bob Proctor have both played an important role in my own growth (plus many others), they are awesome teachers. You might know that Bob always speaks about paradigms. A paradigm is a multitude of habits. They usually origin from childhood and are seated in the subconscious mind. Your subconscious mind is the part of your mind that rules the game. And from what you describe I get the impression, that paradigms might be in your way. So subconscious programming. No matter how hard you try to stay motivated, there is something in the way. No matter how good you understand how it works, you are always overruled by the subconscious program that runs in the background. And from what you write it might be the case that you do have such a paradigm and that the solution lies in changing it. If you don’t change it, it will always be in the way. It is not that you are stupid. You do understand how it works. And still you have a hard time doing it. Sounds familiar? If so, it is a paradigm! Great article !! very well explained , indeed it is true to attain something big you need to have clear vision and desire, but majority people just wish to achieve something but don’t put a lot effort because they don’t desire for that and that is a reason they remain empty hands. Keep sharing such articles. Have a great time!! I have always been driven. I work hard and rarely give up. especially when I really have an end goal that I am passionate about. Currently I am doing all that I can to create an income from home so I can spend more time with my family. Also, I am done working for other people helping to make them rich. I get down sometimes but after reading this I think I am more motivated than ever. Thanks.